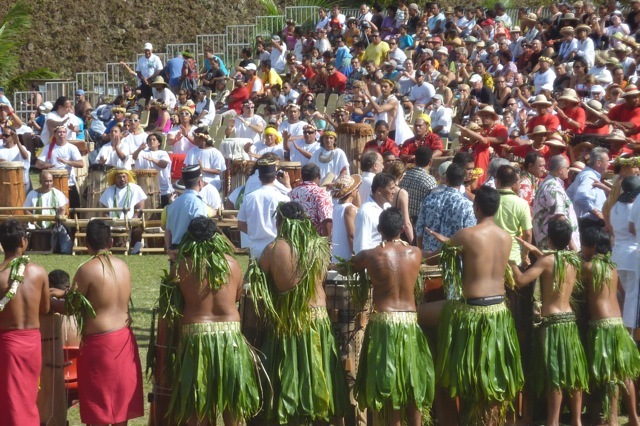 Men in traditional dress pounded on drums while each island's delegation walked, shimmied, or hakkaed onto the grassy football field on the edge of Taiohae. 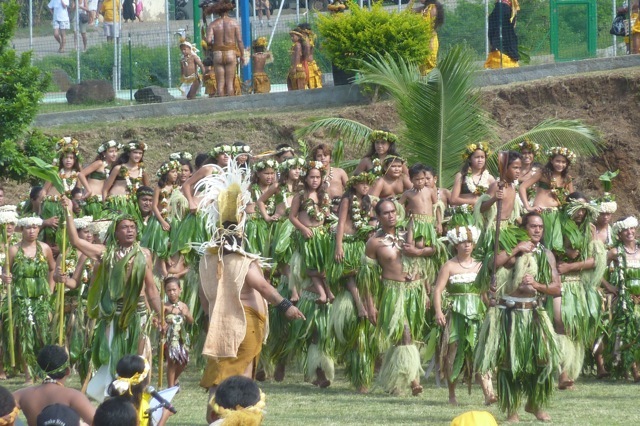 This was the Festival of Marquesan Arts, which happens once every four years. Like Leap Year, but with drums. 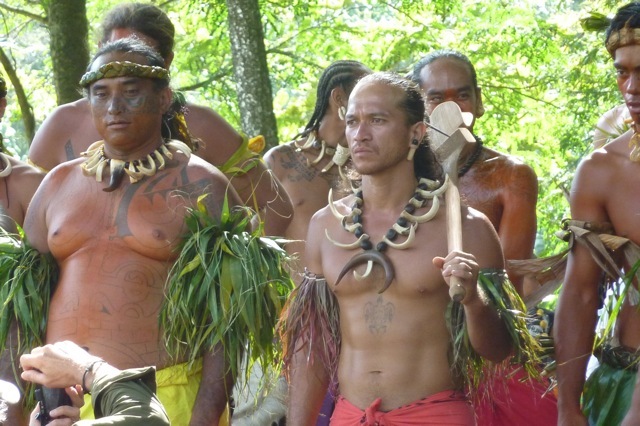 I cowered under a scarf while a woman from Tahiti explained to me what was going on. "Now that's the Catholic priest doing a prayer. Now they will sing hymns. Now there will be speeches." At the speeches, a low groan went over the crowd. Half the people left, so I did too, to head downtown to walk around and see what handicrafts were on offer. In the afternoon, we went to an event that showcased traditional tattooing, basket and hat-weaving, and wood carving. 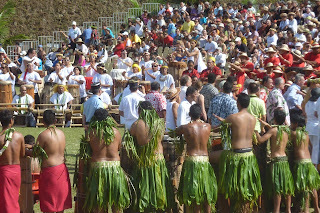 The Ua Pou delegation was demonstrating the wood carving. 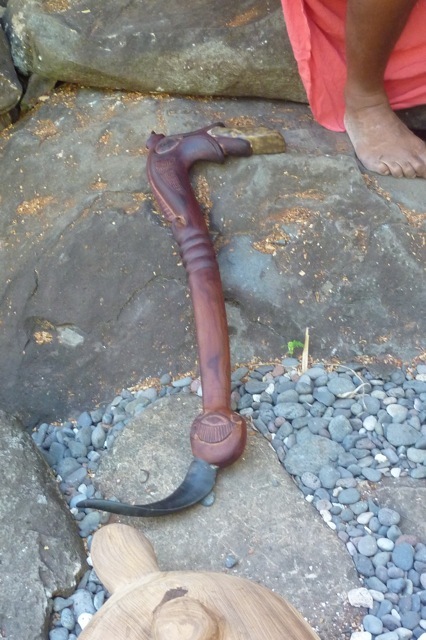 One of the Aranui passengers bought an exquisite piece with an ax-head on one end and what looked like a giant tusk on the other (sort of like a huge wooden bottle opener) for 25,000 frances, which is roughly $250. I'm jealous. I might have to buy a piece too, though the carver told me he couldn't sell them until after the dances tomorrow. The team is using the pieces in their dance. A French man was documenting the Ua Pou delegations experience here as part of a larger project, and he translated for me as I asked questions to the carver about when I could buy a piece from him. His work was exquisitely detailed. Vern had shown me the difference between a highly crafted piece and a simple piece done with no nod to craftsmanship. These were brilliant. "Why does he sell them so cheap?" I asked the French man as we walked away from the Ua Pou pavilion. "That's the culture of Ua Pou. It upsets me—I know how long they've spent working on these pieces and how little they have, but it isn't in their culture to overcharge." I'd thought he'd looked upset that the man had charged 25,000 francs. He'd given me something to consider, though it seems NOT-buying wouldn't help the situation. Here are some photos from the opening ceremonies.